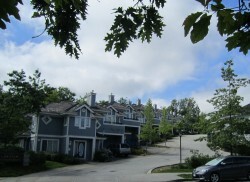 Chelsea View is located at the corner of Oakmount Crescent and Royal Oak Avenue in Burnaby. It was built in 1999 by the West Coast Community Homes Society and was acquired by New Chelsea Society in 2010. Just six minutes from Deer Lake Park, Chelsea View offers residents ready access to the scenic outdoors and recreation. It is also just a 20-minute walk to the Metrotown shopping center and Skytrain station, convenient for quick excursions and access to the rest of the city. 20 family townhouses. Private, self-contained 2-storey units. Convenient access to Metrotown mall, public transportation and Deer Lake Park. Laundry rooms; plumbing hookups in townhouses for residents who bring laundry machines.